Archibald "Archie" Smith was the son of General Washington Smith & Laney Wiggins of Wayne County, GA. He enlisted in the 24th Battalion, Georgia Cavalry September 22, 1863 at Waynesville by Capt. Hopkins. 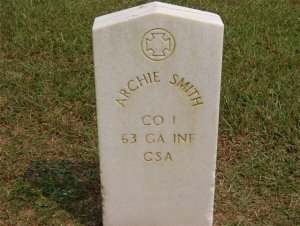 Private Archie Smith served with the 24th and through the consolidation of units was assigned to the 7th Regiment, Georgia Cavalry, Company G in early February 1864. Pvt. Smith transferred on April 17, 1864 to 63rd Regiment, Georgia Volunteers, Company I by order of Brig. Gen. Mercer. On July 30, 1864 Archie Smith fought and died at the Battle of Brown's Mill near Newnan, Georgia and is buried there at Oak Hill Cemetery. Information provided by Susan Mahoney gg granddaughter of Archie Smith.